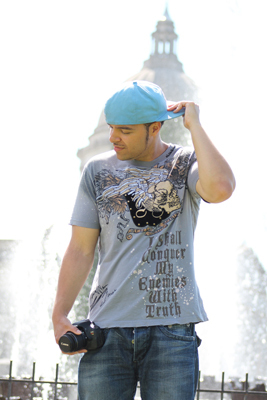 Tony Sway is a Singer/Songwriter & Producer. He has released 3 albums and 3 mixtapes in the last 3 years, all of which have been well received by his audience! His new album, Elevate, placed number 5 in the top 100 R&B/Soul albums on Amazon.com. Tony has also served as a producer/songwriter and vocalist for platinum artist Frankie J and up and coming music star and actor Quincy Brown, the son of R&B singer Al B. Sure and stepson of music mogul Puff Daddy. Sway's beats have also been sold to hundreds of artists worldwide! As an artist, Tony Sway has stirred up a buzz on sites like YouTube with a string of music videos that have been receiving great feedback and have lead to thousands of downloads of his music on iTunes and other sites! Born Anthony Michael Simmons in Olympia,Washington, he comes from a musical family. His grandfather, Sonny Simmons, is a well known Jazz artist who has been signed to major labels like Warner Bros. His love for great music mostly came from the songs his mom would play around the house, records such as Al B Sure, Michael Jackson, El Debarge, Teena Marie, Guy and many more. Sway would later find himself being influenced as a teen by Hip Hop artists like 2Pac, Snoop Dogg, Biggie Smallz, DJ Quik and the list goes on. At the age of 13, T-Sway convinced his mom to pick up his first Keyboard after being influenced by a Dj Quik beat. From that moment on.....that's where the producing, songwriting and singing began!